That’s why the detection rate for cars has outstripped that for bicycles in recent years. Most of the improvement has come from techniques whereby systems train themselves by studying thousands of images in which known objects are labeled. One reason for this is that most of the training has concentrated on images featuring cars, with far fewer bikes. Consider the Deep3DBox algorithm presented recently by researchers at George Mason University and stealth-mode robotic taxi developer Zoox, based in Menlo Park, Calif. On an industry-recognized benchmark test, which challenges vision systems with 2D road images, Deep3DBox identifies 89 percent of cars. Sub-70-percent car-spotting scores prevailed just a few years ago. Deep3DBox further excels at a tougher task: predicting which way vehicles are facing and inferring a 3D box around each object spotted on a 2D image. “Deep learning is typically used for just detecting pixel patterns. We figured out an effective way to use the same techniques to estimate geometrical quantities,” explains Deep3DBox contributor Jana Košecká, a computer scientist at George Mason University in Fairfax, Virginia. Put all of these elements together, and one can observe some pretty impressive results, such as the bike spotting demonstrated last year by Google’s vehicles. Waymo, Google’s autonomous vehicle spinoff, unveiled proprietary sensor technology with further upgraded bike-recognition capabilities at this month’s Detroit Auto Show. Vasconcelos doubts that today’s sensing and automation technology is good enough to replace human drivers, but he believes they can already help human drivers avoid accidents. Automated cyclist detection is seeing its first commercial applications in automated emergency braking systems (AEB) for conventional vehicles, which are expanding to respond to pedestrians and cyclists in addition to cars. Volvo began offering the first cyclist-aware AEB in 2013, crunching camera and radar data to predict potential collisions; it is rolling out similar tech for European buses this year. More automakers are expected to follow suit as European auto safety regulators begin scoring AEB systems for cyclist detection next year. That said, AEB systems still suffer from a severe limitation that points to the next grand challenge that AV developers are struggling with: predicting where moving objects will go. Squeezing more value from cyclist-AEB systems will be an especially tall order, says Olaf Op den Camp, a senior consultant at the Dutch Organization for Applied Scientific Research (TNO). Op den Camp, who led the design of Europe’s cyclist-AEB benchmarking test, says that it’s because cyclists movements are especially hard to predict. That means it may be a while before cyclists escape the threat of human error, which contributes to 94 percent of traffic fatalities, according to U.S. regulators. “Everybody who bikes is excited about the promise of eliminating that,” says Brian Wiedenmeier, executive director of the San Francisco Bicycle Coalition. But he says it is right to wait for automation technology to mature. Poker pro Jason Les with computer mouse in hand plays against the Libratus AI. Humanity has finally folded under the relentless pressure of an artificial intelligence named Libratus in a historic poker tournament loss. As poker pro Jason Les played his last hand and leaned back from the computer screen, he ventured a half-hearted joke about the anticlimactic ending and the lack of sparklers. Then he paused in a moment of reflection. Libratus lived up to its “balanced but forceful” Latin name by becoming the first AI to beat professional poker players at heads-up, no-limit Texas Hold’em. The tournament was held at the Rivers Casino in Pittsburgh from 11-30 January. Developed by Carnegie Mellon University, the AI won the “Brains Vs. Artificial Intelligence” tournament against four poker pros by $1,766,250 in chips over 120,000 hands (games). Researchers can now say that the victory margin was large enough to count as a statistically significant win, meaning that they could be at least 99.7 percent sure that the AI victory was not due to chance. Previous attempts to develop poker-playing AI that can exploit the mistakes of opponents—whether AI or human—have generally not been overly successful, says Tuomas Sandholm, a computer scientist at Carnegie Mellon University. Libratus instead focuses on improving its own play, which he describes as safer and more reliable compared to the riskier approach of trying to exploit opponent mistakes. Even more importantly, the victory demonstrates how AI has likely surpassed the best humans at doing strategic reasoning in “imperfect information” games such as poker. The no-limit Texas Hold’em version of poker is a good example of an imperfect information game because players must deal with the uncertainty of two hidden cards and unrestricted bet sizes. An AI that performs well at no-limit Texas Hold’em could also potentially tackle real-world problems with similar levels of uncertainty. In other words, the Libratus algorithms can take the “rules” of any imperfect-information game or scenario and then come up with its own strategy. For example, the Carnegie Mellon team hopes its AI could design drugs to counter viruses that evolve resistance to certain treatments, or perform automated business negotiations. It could also power applications in cybersecurity, military robotic systems or finance. The Libratus victory comes two years after a first “Brains Vs. Artificial Intelligence” competition held at the Rivers Casino in Pittsburgh in April-May 2015. During that first competition, an earlier AI called Claudico fell short of victory when it challenged four human poker pros. That competition proved a statistical draw in part because it featured just 80,000 hands of poker, which is why the Carnegie Mellon researchers decided to bump up the number of hands to 120,000 in the second tournament. The four human poker pros who participated in the recent tournament—Jason Les, Dong Kim, Daniel McAulay, and Jimmy Chou—spent many extra hours each day on trying to puzzle out Libratus. They teamed up at the start of the tournament with a collective plan of each trying different ranges of bet sizes to probe for weaknesses in the Libratus AI’s strategy that they could exploit. During each night of the tournament, they gathered together back in their hotel rooms to analyze the day’s worth of plays and talk strategy. The human strategy of playing weird bet sizes had its greatest success in the first week, even if the AI never lost its lead from the beginning. 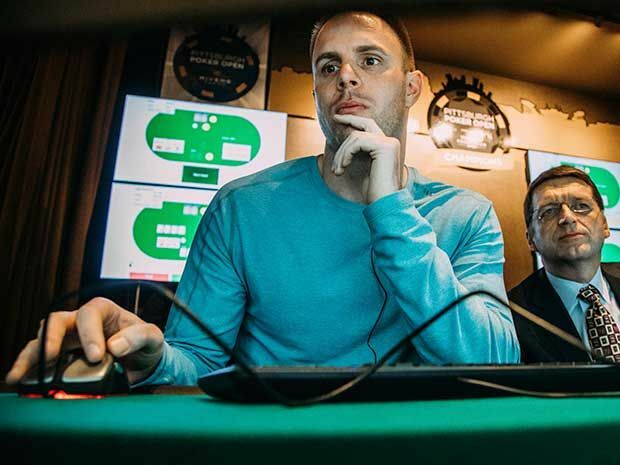 Libratus held a growing lead of $193,000 in chips by the third day, but the poker pros narrowed the AI’s lead by clawing back $42,201 in chips on the fourth day. After losing an additional $8,189 in chips to Libratus on the fifth day, the humans scored a sizable victory of $108,775 in chips on the sixth day and cut the AI’s lead to just $50,513. But Libratus struck back by winning $180,816 in chips on the seventh day. After that, the “wheels were coming off the wagon” for the human poker pros, Sandholm says. They noticed that Libratus seemed to become especially unbeatable toward the last of the four betting rounds in each game, and so they tried betting big up front to force a result before the fourth round. They speculated on how much Libratus could change its strategy within each game. But victory only seemed to slip further away. One of the players, Jimmy Chou, became convinced that Libratus had tailored its strategy to each individual player. Dong Kim, who performed the best among the four by only losing $85,649 in chips to Libratus, believed that the humans were playing slightly different versions of the AI each day. In fact, Libratus played the same overall strategy against all the players based on three main components. First, the AI’s algorithms computed a strategy before the tournament by running for 15 million processor-core-hours on a new supercomputer called Bridges. Second, the AI would perform “endgame solving” during each hand to precisely calculate how much it could afford to risk in the third and fourth betting rounds (the “turn” and “river” rounds in poke parlance). Sandholm credits the endgame solver algorithms as contributing the most to the AI victory. The poker pros noticed Libratus taking longer to compute during these rounds and realized that the AI was especially dangerous in the final rounds, but their “bet big early” counter strategy was ineffective. Despite the historic victory over humans, AI still has a ways to go before it can claim to have perfectly solved heads-up, no-limit Texas Hold’em. That’s because the computational power required to solve the game is still far beyond even the most powerful supercomputers. The game has 10160 possible plays at different stages—which may be more than the number of atoms in the universe. In 2015, a University of Alberta team demonstrated AI that provides a “weak” solution to a less complex version of poker with fixed bet sizes and a fixed number of betting rounds. There is some good news for anyone who enjoys playing—and winning—at poker. Libratus still required serious supercomputer hardware to perform its calculations and improve its play each night, said Noam Brown, a Ph.D. student in computer science at Carnegie Mellon University who worked with Sandholm on Libratus. Brown reassured the Twitch chat that invincible poker-playing bots probably would not be flooding online poker play anytime soon. As the final day of the tournament wound down, the Carnegie Mellon professor thanked the online viewers for watching and supporting the competition. And he took the time to answer a number of lingering questions about the new AI overlord of poker. Gita is an autonomous delivery robot from Piaggio Fast Forward that can carry up to 40 lbs. Gita can follow behind you or travel on its own to a pre-mapped destination. IBM predicts that in five years artificial intelligence will be able to detect and monitor mental health issues by analyzing patterns of speech and writing. Watch DJI Inspire 1 drones show of their passing skills at the NFL Pro Bowl Skills Competition in Orlando.